Himself, being something in the nature of a large and wonderful cat, doesn't favour the water! Hi sweetie! Hope all is going well and they give you some time off soon! *whew* All the inhabitants of Hotel Beard-Ewing say howdy! Hi everyone. It's 3am. Just checking in before going to bed. We managed to sort out our telescope pointing problems. It turns out that the astrometric standard stars the project scientists had brought along to test the telescope with all had incorrect coordinates. The problem wasn't in the astrometric catalogue the stars came from but in the utility the scientists had used to extract the information on the stars into a spreadsheet. We've been racking our brains trying to locate a fault in the telescope, and all that time we were giving it faulty information. The telescope was right after all. There must be a moral in that story somewhere. Hi Kath. No I don't swim, but the pool here is quite popular. It must be a good way to relax here after a busy day. I've been for a few walks around the site and watched the beautiful sunset from the Star Track walkway. No, I haven't seen Supernova. Lanen! I'm going to get some time off after lunch tomorrow and telephone you and our guests. I hope you have a good (night's) sleep, Steven. Pity you don't swim but resting is good too. Well, whaddayouknow about feeding the telecope wrong data... That must have been a big surprise after finally finding it out. Was there much swearing? Hi love! I'm so thrilled that you can plan to take a little time off to talk with us. Your parents are coming about 7, I think, so any time after that ought to be ok. I miss you! Hiya Hans - no, alas, T&M are in the US at the moment. Darn it. Still, much revelry is being planned. A gal doesn't turn 50 every day! The sooner a fault gets discovered and corrected the better as far as I'm concerned. Kath, you probably prevented much worse problems down the line, so although the next two observers got cancelled I bet the ones after that had more reliable sessions because of the maintenance work. It was lovely talking to you Lanen . The telescope isn't yet in a state where any observer. We had a couple of primary mirror control faults last night, where just in the middle of some critical measurement the star images suddenly blew up like balloons. The primary mirror is floating on some air bags, which take most of its weight. Scattered around the mirror at regular intervals are force actuators which the active optics system uses to bend the mirror and correct its shape as the telescope moves and in sags under its own weight. When those actuators fail, the mirror drops onto the air bags and the image quality goes to pot. One of those teething problems a new telescope goes through. You don't get this problem with a backyard telescope. We have some senior managers visiting today, so we have to be on our best behaviour. The plan for the coming night is to make it look like we're doing something really useful and worthwhile. If at the same time we end up actually doing something useful and worthwhile that's a bonus. WOW, WOW, WOW ...now this is all fantastic to see. From the telescope, to the star photos, and the gift from the Bond movie. I never imagined that the telescope looked like it does...seems I've watched to many old Sci-fi movies..LOL. It's fantastic to get to see what it really looks like. To think I actually know someone that has, and is working on this project, is wonderful. I can hardly wait for further updates. Thank you Steve for taking your very precious time to *Show and Tell* for us....instead of getting a few more winks of sleep. Thanks Lady Maelin. Well, we did manage to show the senior managers something worthwhile last night. We managed to get the active optics software to focus the telescope and correct the secondary mirror alignment automatically. That's quite a big milestone, although we discovered the software needs a lot of correction: for example some of the CCD images needed to be reflected before the software will work, but that's debugging for you. I missed the end of last night because I had to retire early with a headache and symptoms of altitude sickness, although I'm ok again today. I should show you what the environment is like around here. This is what the residencia looks like from above ground as you approach it. It's no wonder they used it for a James Bond movie! Who would know there is a simulated rain forest like this down there under that dome? and you can see all the individual rooms. The windows are tiny - again to keep down any light polution. All those windows point away from the telescopes. It's a really well designed building. You'll notice there is very little life out here on the edge of the Atacama desert - no trees or grass or anything visible. Besides looking amazing, the environment here is quite harsh. The observatory is at an altitude just under 9000 feet, which takes a while to get used to. The humidity is also very low - usually between 5% and 20% and the UV radiation from the Sun is very strong. So moisturizer, sun screen and sun hats are the order of the day. You can read the same safety and information leaflet I was given on the web here. Well, it's time for dinner and other night of telescope debugging. Goodnight folks. "A gal doesn't turn 50 every day! " Thank you for the great insight into your work. That's an amazing place. I shouldn't wonder if makers of Sci-Fi movies and TV aren't standing in line to try to "rent" the place! Have to say my first thought when I looked at it was Ballybran! is Steven Mr. Underhill now? Oh wow, thanks for sharing the new photos Steven! The area is so very starkly beautiful. 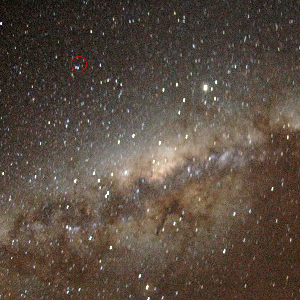 Gosh, two Bond movies (at least) have now filmed bits at telescopes in South America. I wonder which observatory they'll use next? Hi folks. Hans, if I find a ring I'll chuck it into the nearest convenient volcano. I am waiting in the residencia lobby making use of their wireless Internet while my room is cleaned. We're meeting up for lunch in half an hour, and then it's another lunch day's commissioning. Last night we seemed to make progress backwards. Some of the things we though were working a couple of nights ago stopped working. That doesn't mean we're not making progress - just that we were a bit too optimistic a couple of nights ago. Sometimes you get lucky and something just happens to work, but you need to keep testing to make sure it will always work the way you expect. That's all part of the commissioning experience. I have commissioned many new instruments in the past, but this is the first time I have commissioned a new telescope at the same time. It means there is no familar thing to fall back on. We can't say something like "something funny is happening but it must be the instrument because we know the telescope works". In this case the telescope and instrument are both unknowns. Something scary happened last night. In the middle of one of our tests, the primary mirror control system decided to go berserk and make all our star images look banana-shaped. No matter what we tried, the system would not recover. Just for a few minutes we had that awful feeling of "what on earth have we done?". It can be scary thinking you might have broken several million pounds worth of equipment (rather like hiring an expensive sports car and hearing grinding noises from the engine.) But it turned out to be nothing to do with us. The primary mirror system just has some intermittent problems that need sorting out - something for the mechanical engineers to work on. Well, if you think someone might feel like blaming you for millions of pounds worth of problems, maybe you should keep that ring in your pocket a little longer! The real question is, do you look like a banana? Sorry things are being cursed awkward, dearest. Your mum and dad say hi, I've told them I'll forward your phone number when you go down to Anto. Hang in there, dear heart. Well I just had to share the amazing photos of the residencia, and the incredible landscape surrounding it, with the whole family...the Girls thought it looked " Way Cool, just like being on the moon". Good thing they have a few trees inside, as other wise you might forget what one looked like after being there for to long. Steve thanks for all the great shot and the background on the Bond Moves too. To all the other stargazer here on MoM. I hope your stargazing go great! Oh I just thought of something. The outside of where you are staying could be Ballybran from the Crystal Singers. You're not the first one to say so, GinnyStar. Eerie looking place I must say. I imagine it's odd walking there at night with no lights but the stars and the moon. We're going to have a partial solar eclipse on Aug 1! Hello folks. By coincidence I did spend some time on my own last night just staring up at the stars. The sky here is absolutely incredible, and when your eyes are dark adapted you can actually see by the light of the stars (especially this time of the year when the Milky Way is high in the sky). My eyes were helped by the light from Jupiter, which at this really dark site casts a shadow. I took a photograph of the night sky, which I don't have time to show you at the moment. I'm packing up my stuff because I catch a bus in a few hours to go down to sea level for my mid term "descanso". That means I get to have a rest after this week of insane working hours. There was a bit of a disaster last night. The primary mirror support system decided to give up altogether. I think there has been a fault lurking in there for a while, and last night it decided to break for good. There will be a lot of engineers today taking the system apart to trace and replace the faulty component. So it's just as well I chose today to go away for a rest. It doesn't actually look at all like Ballybran would. Ballybran has scrub and ground cover. It gets enough rain from the storms that it wouldn't be desert like that. This isn't saying that Ballybran doesn't have deserts, but we never see them in the books. Hans, that's fantastic. Thank you! I got most of that, thanks to the Spanish books I brought with me. I forgot to mention that the primary language here is Spanish - even at the observatory. That makes it tough going for someone like me who isn't very good at languages. Lanen will tell you the first thing that goes when I'm tired is my language skills. So you should see me trying to order desayuno after 16 hours at work. You can clearly see the Milky Way streaking through the picture. Over at the bottom left hand edge you can see the Southern Cross and the dark cloud known as the "coal sack". In the middle of the picture is the centre of our galaxy. Just to the left of that, if you look carefully, you can see the constellation of Scorpio. It has a distinctive curved sting. The brightest object near the centre of the picture is the planet Jupiter, which was casting a shadow when I took the picture. You can see how bright the star light was by contrast with the dark horizon. With skies as fantastic as that, you can see why they built an observatory there. I never cease to be flabbergasted whenever I'm standing outside looking up at a starscape like that. It looks like someone painted it onto the sky. I'm going to bed now for my first complete night's sleep in over a week. Goodnight folks. Thanks again for all your good wishes. Steven, that pic is incredible!!!!! Sometimes we can get a beautiful view of the night sky here, but nothing like that!!! Thanks for sharing it with us! I stared at that image so long my eyes have gone funny. Now I understand how and why the Elves so enjoyed walking in starlight. Thanks so much for sharing your experiences with us!!! I'm glad you're getting a chance to rest before your brain got fried. Sweet dreams! Awesome picture! Thanks for sharing! Didn't Steven publish a picture like this from a few years ago in our Rukbat Tread. It's just as spectacular as this one. Thanks for posting the picture, Steven. Last edited by Hans; Jul 29 2008 at 07:45 AM. Wow! What a wonderful photo! Cheryl, you were close but not quite. You ringed beta Sagittarii, which is a double. Rukbat is the next bright star over to the right from your label. It's just above the constellation of Corona Australis (the Southern Crown) which makes an upside down U shape. I'm still determined to observe Rukbat with VISTA, but there's still an awful lot of testing to do with the standard 2MASS stars. Rukbat might be too bright for this telescope. We're trying to avoid stars brighter than 4th magnitude to prevent persistence effects on the detectors. (If the detectors see a very bright object you sometimes get an "after image" which lasts several minutes.) My best bet would be to observe Rukbat as the very last thing we do before closing up at the end of the night. We'll see how the next 2 weeks go. Besides, it's better to wait until we've sorted out the image quality, then get a good picture of Rukbat. I have to agree...your latest photo is fantastic to see...I am so glad that your being able to take these kinds of photos with such a wonderous telescope. Have fun!!! Lady M, the picture I posted was taken with my digital camera with a fish-eye lens covering most of the sky. The VISTA telescope has a much smaller field of view than that (1.5 degrees - just a bit larger than the full Moon). So it will take much more zoomed in pictures. I do, however it looks different. Last year, we had an eclipse and it looked fantastic when I was going to work. I think I was very nearly late getting to work that night. Lucky you gets to have a look at these things everyday. I know we have never seen it but it just an idea. All you need to do is add background taken from the books and you could get an idea for Crystal Singers. Or how a Mars base? Which reminds me Happy Birthday, Steve B a bit late.